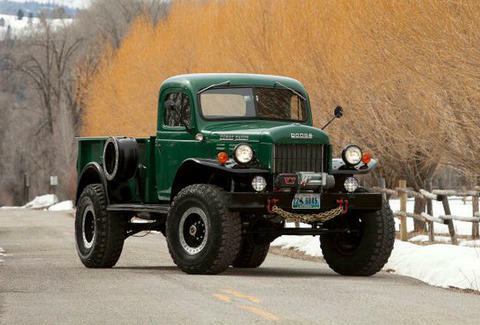 Proving old-school trucks are good for more than scrap metal and providing cinder block with some much-needed company, Legacy Power Wagons meticulously transforms original Dodge Power Wagons into beastly Frankentrucks that're the "toughest money can buy". Investing 600 man-hours into each rig (not including upgrades), they start by restoring the trucks to their original aesthetic condition, then modernize pretty much everything else, building in a new dash, power steering, 4-wheel disk brakes, AC, a wildly powerful engine (either a 426hp Magnum V8 or a Cummins Turbo-Diesel), and a 16,500 lb front winch, which probably still can't haul away the crippling insecurities that make one need such a truck. Custom options include extended cabs, specific wheel configurations, paint jobs, and amenities from retractable side steps, to long-range fuel tanks, to a satellite phone, in case you're the one in need of company.